When you set off from port or from shore it is worth to keep in mind odds and ends about the safety of the vessel and the crew; then it is more likely that everything goes well. Or as an old expression says: “Eigi veldur sá er varar” which roughly translated means that if something happens which you have been warn about, it is not the persons fault who warned you, but your own. The vessel is our safety device, and if it happens that we have to abandon the vessel, we have a problem. The captain is responsible for our vessel being as safe as possible, but it cannot be forgotten that the crew has a collective responsibility. It is a good rule to go on a patrol around the vessel and find the safety- and lifesaving equipment on board. It can come in handy at a critical moment to have done so. We never know when it is our turn. Therefore we should always be prepared for the worst – It does not hurt. Do we know where the life jackets are stored? And how to put them on? What are the straps for? The crotch strap is one of these straps; it is necessary so that the life jacket stays in place. If you need to jump to the sea or water with the life jacket on, and the straps are not fastened correctly, the life jacket can come off when you hit the water and knock you underneath your neck and break it, which can lead to death. Immersion suits are on board some vessels. 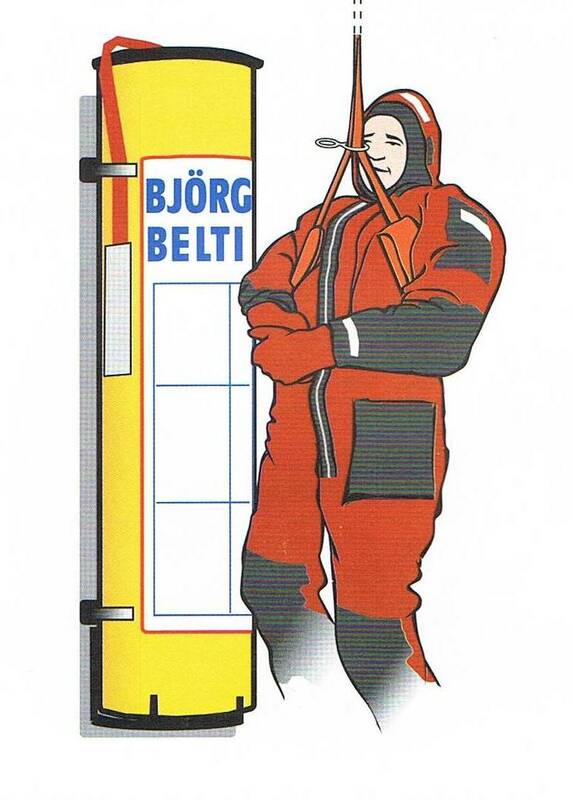 If such a suit is on board your vessel, you should practise putting it on; because on a critical moment it is good to know the right way to put it on. 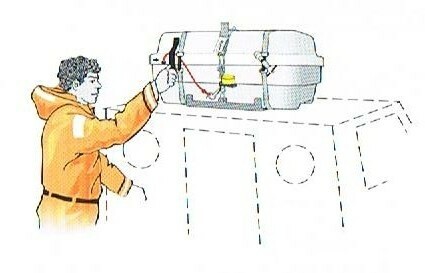 The life raft is usually located on the top of the wheelhouse or in the stern. 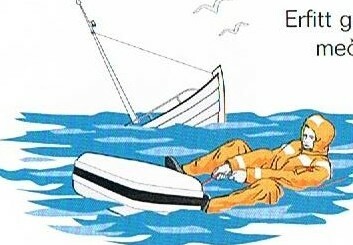 It is important to know how to use the life raft and where it is located. Icelandic vessels are equipped with an automatic release unit for life rafts which safely releases the raft on a critical moment; the unit has been approved by the Icelandic Maritime Administration. One or two life buoys are on board and they are thrown to persons who fall overboard. 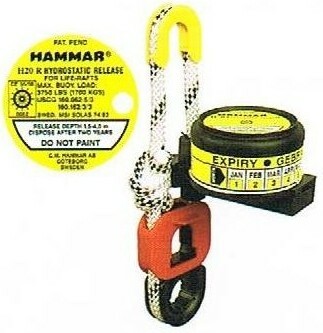 A line is secured to the life buoy which can be used to pull a person in the sea to the vessel. A boat hook should be on board every small vessel; it can often come into good use when to rescue a person from the sea. Every small vessel has a secured ladder or a step to make it easier to enter the vessel from the sea. The lifesling is convenient and good lifesaving equipment which can be thrown to a person which has fallen overboard. It can also be used to lift a person into a helicopter. The lifesling is located at every pier here on Iceland. It is often better to use the lifesling than a life buoy, because if you can manage to slip it over you the risk of it to loosen is lesser than with the life buoy. This is all fine and dandy. Remember; always proceed with caution. Ignorance is our worst enemy. We should not let that befall on us. Do we know where the life jackets are stored? And how to put them on? What are the straps for? The lifesling is convenient and good lifesaving equipment which can be thrown to a person which has fallen overboard. It can also be used to lift a person into a helicopter.